Welcome to Sejah Farm of the Virgin Islands! Sejah Farm is located on the island of St. Croix, U.S. Virgin Islands – the largest of the three sister islands, which include St. Thomas and St. John, territories of the United States Virgin Islands. Sejah Farm is situated in what we call the ‘farm belt’ of the island. Its fifteen acres of farm land, consists of eleven acres that are used as grazing for sheep and goats; three acres that are used for vegetable crop production; and, three quarter acres used for poultry production. We raise Boer Goats and Boer Goats crosses for sale, local fresh meat, and vegetables for local and off-island demands. We provide agricultural technical assistance, seminars, education, training, and consultation to farmers and the community. It is our mission to produce the finest quality raise meats (lamb, goat, and chicken) and organic vegetables in the U.S. Virgin Islands to meet the local market demand. We expect to exceed our customers expectations in quality, delivery, and cost through continuous improvement and customer interaction. Sejah Farm was established in 1998, and is owned and operated by Dale and Yvette Browne. 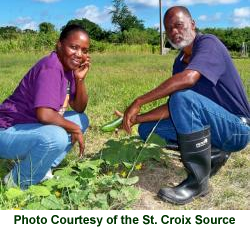 They are founders of the Virgin Islands Farmers Cooperative, Inc., which was organized for the resurgence of the Virgin Islands Agricultural industry. Dale and Yvette were awarded the 2006 Livestock Farmers of the Year Award by the Virgin Islands Department of Agriculture.